The Street Profits VS Chris Star & Riley Apex; Street Profits win. NXT Women’s Championship: Ember Moon VS Sonya Deville; Ember wins and retains the NXT Women’s Championship. NXT Championship #1 Contender Fatal 4 Way: Aleister Black VS Johnny Gargano VS Lars Sullivan VS Killian Dain; Gargano wins and will challenge Andrade “Cien” Almas for the NXT Championship at TakeOver: Philadelphia. The Street Profits VS Chris Star & Riley Apex! As the song says, Angelo Dawkins & Montez Ford “bring the swag like nobody can”. 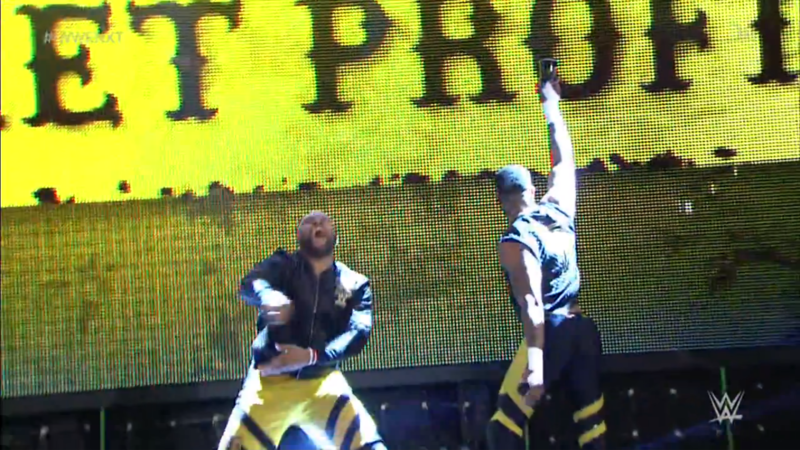 Will they continue to roll on through the NXT Tag Team Division? The bell rings, Ford starts against Apex, they have a quick flex battle before tying up. Ford gets the headlock, Apex powers out, Ford flips up and over him. Things speed up, Ford runs Apex over and tags Dawkins. Back suplex splash, then secret handshake, but Apex gets away in the meantime. Tag to Star, he runs in, Dawkins runs him over! The Curse of Greatness solos Star and Apex, stirs it up and hits the spinning splash. Dawkins then gives Star the big spinebuster, and tags Ford. Ford goes up, takes aim, and hits the frog splash! And as they celebrate, they grab themselves some microphones. “My brothers and sisters!” The year 2017, “we came, we saw, and by God in 2018, we conquer!” Authors of Pain? They’ve got cool vests, but no. SAnitY? Rooftop parties are fun, but no. The Undisputed Era? They have the titles in 2017, but in 2018, “we coming. We here.” Will the New Year see Dawkins & Ford roll on and go for gold? NXT Women’s Championship: Ember Moon VS Sonya Deville! Absolution’s Lady Gladiator isn’t done with NXT just yet, can she snuff out the Prophecy of Flame’s dream-come-true reign already? The bell rings, they tie up right away, Sonya gets the waistlock. Sonya brings Ember down, Ember gets up for the standing switch, Sonya slips down for the takedown, Ember scrambles to ropes when Sonya goes for the grapevine ankle lock. Sonya grins as she watches the champion get to her feet, daring her to come out. She and Ember circle and tie up again, Ember puts on a headlock. Sonya powers out, Ember flips out of the hip toss to arm-drag Sonya away. Ember kip-ups and watches Sonya with a grin. The two go again, waistlock from Sonya but standing switch from Ember. Sonya bucks her off, swings a kick but misses, Ember swings and misses, too. Sonya sweeps the legs, Ember ducks the kick and kip-ups but Sonya dodges the Superkick. Fans applaud as the two evenly matched women stare down. Sonya calls for a test of strength, but kicks low. She brings Ember up to whip, Ember reverses and follows to dropkick Sonya down. 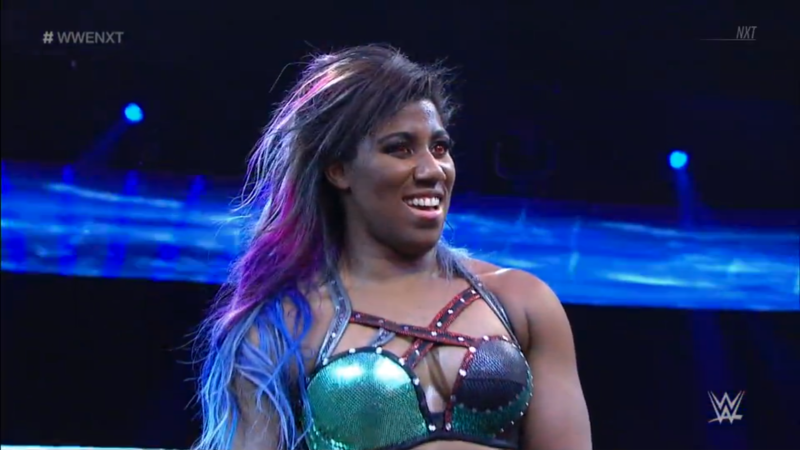 Ember watches Sonya roll out of the ring and walk it off. Ember suddenly goes to the apron, and jumps for a cannonball! Sonya topples over, Ember stands up and roars. The champion has control while we go to break. 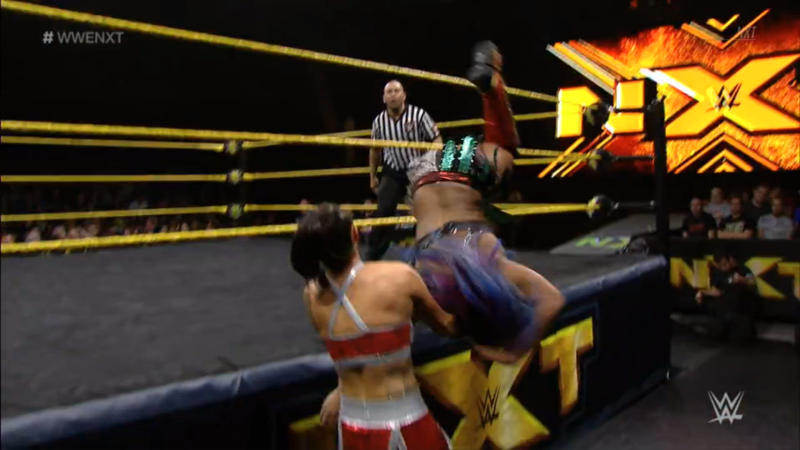 NXT returns, Sonya has control now as she drives knees into Ember’s ribs and head. Cover, TWO, Sonya keeps her cool as she puts a rear bearhug on the champ. Ember endures the squeeze, fans build to a rally and she gets to her feet. Ember turns around, Sonya lifts her and drops her! Another cover, TWO. Sonya keeps on Ember with toying kicks and hammering hands. Ember gets to her feet only for Sonya to knock her back down. Sonya returns to the rear bearhug, fans build to another rally. Ember gets up, elbows back, then uses a wheelbarrow takedown to send Sonya into buckles! Both women are down but Ember rolls to get space. The ref counts while the two stir. Sonya uses ropes to climb to her feet, then walks over to Ember, Ember ducks the punch for a double underhook suplex. Ember starts rallying, kicking and knocking Sonya down, cover, TWO! The champion keeps her focus as she catches her breath. Sonya gets to a corner, Ember runs in and blocks the boot, but Sonya turns that into a driving knee drop! Cover, TWO! Sonya is frustrated, and checks her jaw while Ember rolls away. Sonya dares Ember to stand up as she takes aim. Ember dodges the sliding knee, Sonya blocks Ember’s clothesline, Ember ducks Sonya’s to then hit a springboard missile dropkick! Sonya rolls away to a corner, Ember runs in and hits a stiff forearm smash. Ember then hurries to the top rope and takes aim at Sonya, and hits the Eclipse! Ember wins and retains her title! She has overcome her challengers and doubters, can the Prophecy of Flame continue to Eclipse the Women’s Division? There is someone who would like to test the new champion’s toughness. It’s the Pirate Princess, Kairi Sane! 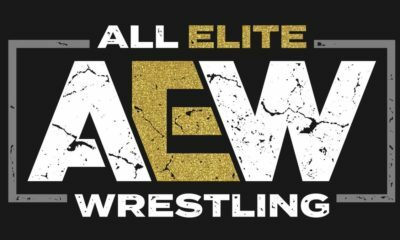 The Mae Young Classic winner was also part of that Fatal 4 Way to crown a new champion. She now spies Ember and the title through her telescope. Ember grins, welcoming the competition. Will Ember’s reign make it through the start of 2018? Or will the Pirate Princess claim the championship as her treasure? But wait! Another contender stakes her claim, it is SHAYNA BASZLER! The Queen of Spades has unfinished business with Kairi Sane, she makes her tap to the rear naked choke! Shayna doesn’t let go until referees come out to stop her. Shayna lets go and then stares daggers at Ember Moon in the ring. Ember grins again. She isn’t afraid of Shayna Baszler, even after watching her choke the Pirate Princess out. Should she be afraid that the Queen of Spades is finally here? 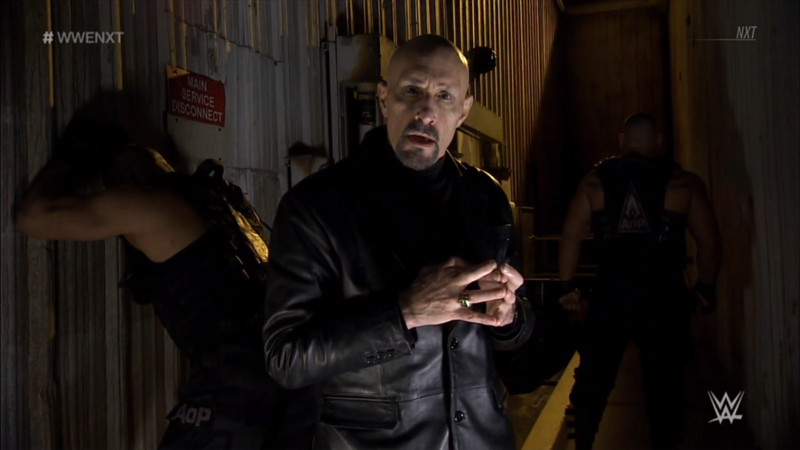 Paul Ellering speaks on behalf of his Authors of Pain. “In NXT history, the Authors of Pain have defined it. From day one they were undefeated!” They became champions, Dusty Rhodes Classic winners, and then War Games comes along. “Mr. Cole, Mr. Fish and Mr. O’Reilly” will not write NXT’s next chapter, the Authors of Pain will. And it shall start like this: “This is OUR house! We are the law. We are the judge, jury and executioner.” The Undisputed Era are on borrowed time, when will it run out? 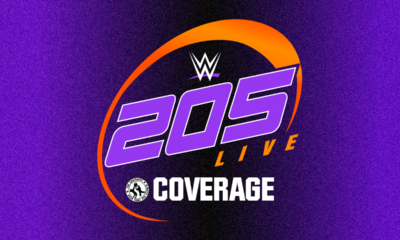 How does the NXT Women’s Champion feel about what happened between Kairi Sane & Shayna Baszler? Ember knew that being champion meant having a target on her back. However, if Kairi or Shayna want to make a statement, just step in the ring with her. 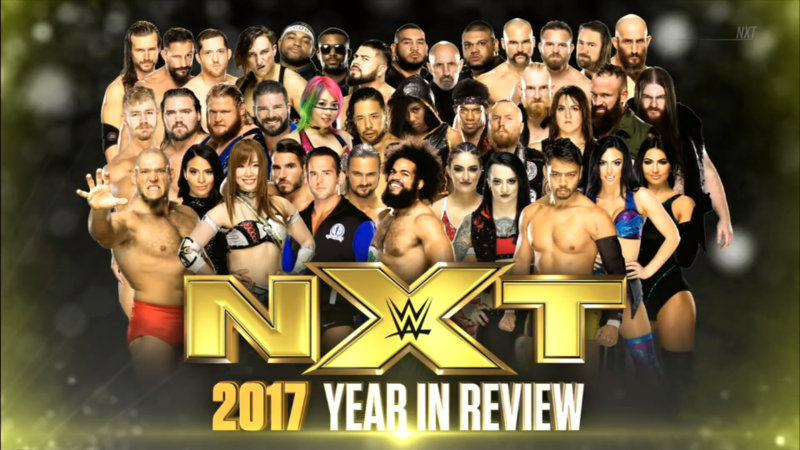 Next week, NXT takes a look back on 2017! 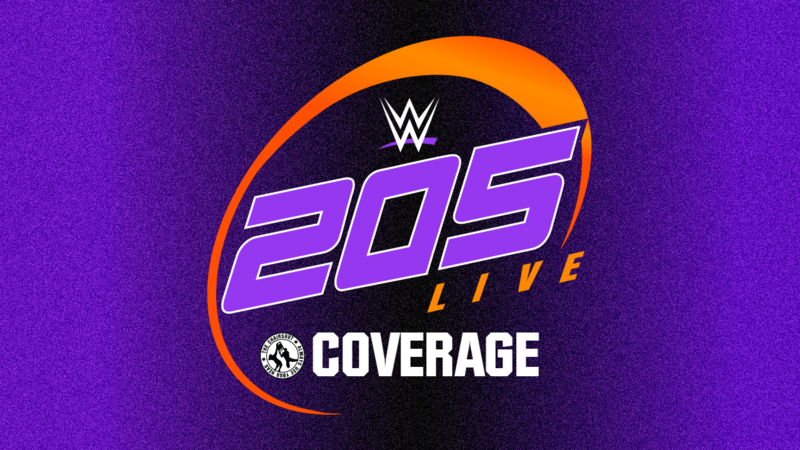 Join Mike Rome and Kayla Braxton for a two hour retrospective of WWE’s sensational developmental brand for all the highlights, great moments and great superstars, including the underdog rise of new NXT Women’s Champion, Ember Moon. 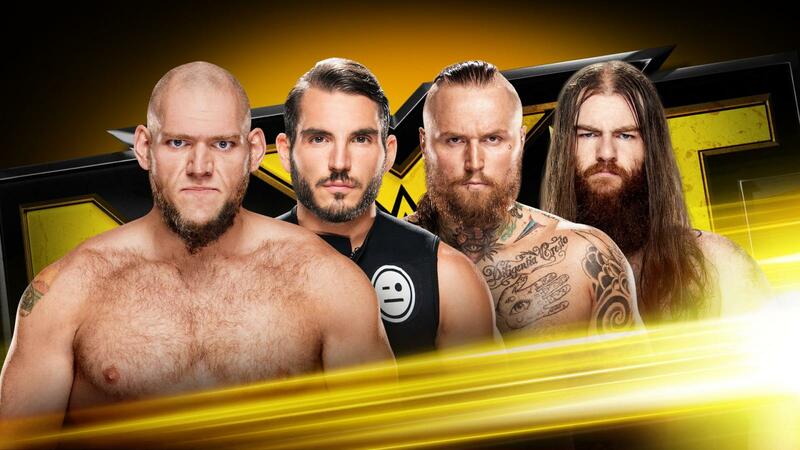 NXT Championship #1 Contender Fatal 4 Way: Aleister Black VS Johnny Gargano VS Lars Sullivan VS Killian Dain! Drew McIntyre’s unfortunate accident gave rise to great opportunities. 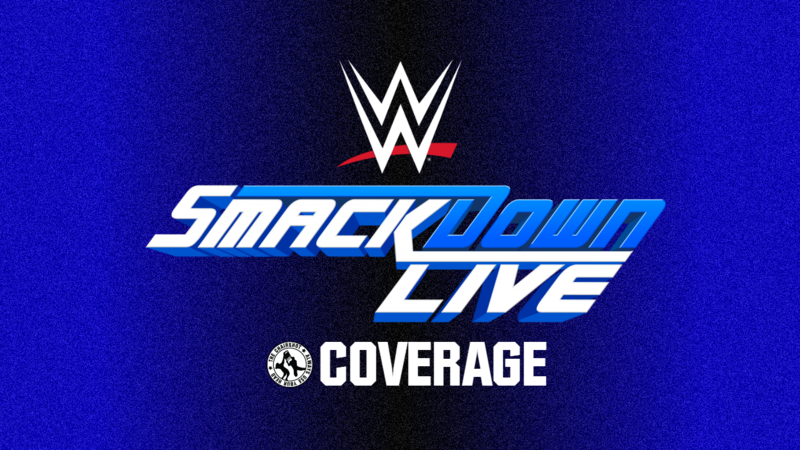 The Embodiment of the End made Adam Cole #FadeToBlack, The Leviathan delayed the dream of Roderick Strong, SAnitY’s Beast of Belfast bulldozed Trent Seven and the biggest surprise of all, Johnny Wrestling replaced the Velveteen Dream and overcame Kassius Ohno. 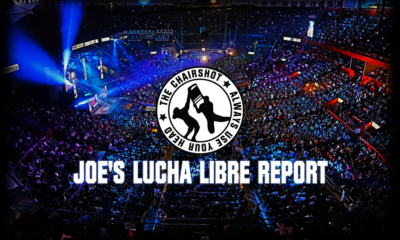 Which one of these four will win the right to face Andrade “Cien” Almas at TakeOver: Philadelphia? The four men stare down, the bell rings and fans are already cheering for Gargano and Aleister. They cautiously approach each other, Aleister swings on “Big Damo” and it sparks a brawl! Damo corners Aleister while Lars puts Gargano in another. Damo throws hands on Aleister while Lars just throws Gargano. Aleister kicks Damo away, then kicks Lars. Lars runs back at him, Aleister side-steps to send him out, then Aleister kicks Damo down with a roundhouse. Aleister runs, Lars gets out of the way, Aleister springboards to then sit down in the center of the ring. Fans applaud this opening sequence. Aleister runs at Damo, Damo puts him on the apron, Aleister forearms Damo away. Lars comes over but Aleister fights him off, then MOONSAULTS! Lars catches Aleister! He then throws Aleister at the apron, and Aleister bounces off to tumble to the floor. Meanwhile, Gargano back elbows Damo away, then takes aim at Lars for a slingshot plancha! Lars catches Gargano, too, for another big bounce off the apron edge. Damo builds speed and DIVES on Lars! 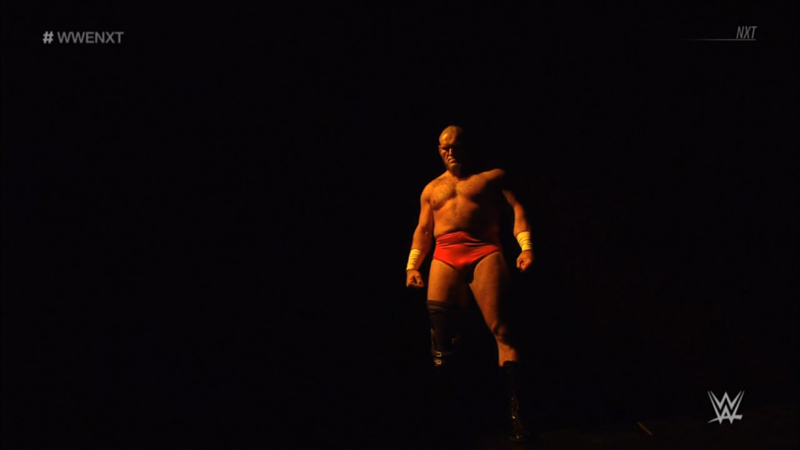 One behemoth topples over the other, and fans fire up with a standing ovation for “NXT! NXT!” while we go to break. 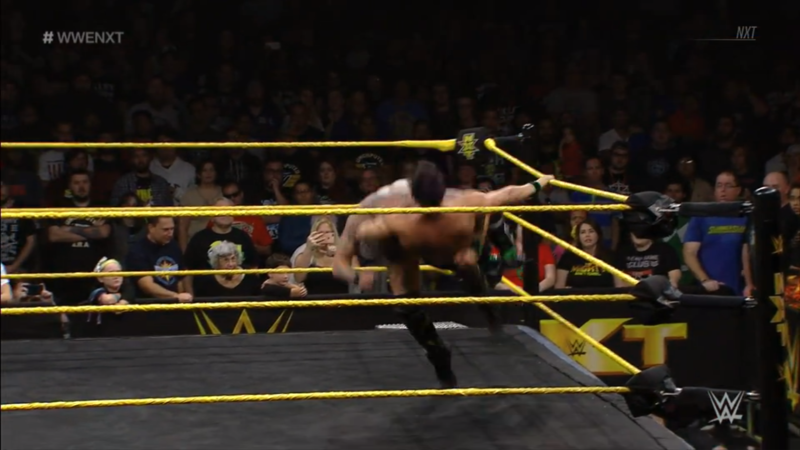 NXT returns, Damo whips Gargano corner to corner. Damo runs in and squashes Johnny Wrestling, cover, TWO. Lars returns to drag Damo out then ram him into the apron. Lars goes into the ring and squashes Gargano in a corner, cover, TWO. Damo returns, drags Lars out now, but Lars throws Damo into steel steps. Aleister returns, he kicks Lars up the ramp. They reach the stage, Lars throws Aleister off it! Gargano goes after Lars with forearms, but Lars gives him a knee. Lars uses a gorilla press to lift Gargano and throw him at Aleister! 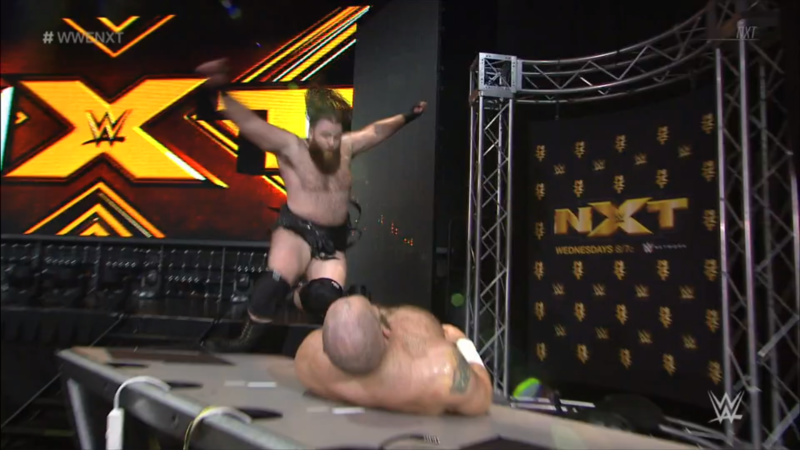 Aleister and Gargano are down, Lars tells the ref “I do what I want!” Speaking of which, Lars storms over to the NXT Announce Desk and clears it off. He then drags Gargano up and over, lifting him into powerbomb position. Gargano holds onto the girder for dear life! He mule kicks Lars, Aleister flies in to give Lars a knee strike, then Gargano gives another mule kick. Gargano climbs down, and gives Lars a SUPERKICK that sets him upon the table. Gargano fires up the fans, but he spots Damo on the stage, he ducks as Damo FLIES onto the table! The fans and even Gargano are shocked at what they just witnessed. Gargano and Aleister leave the fallen monsters behind as they head for the ring. They stare down, fans fire up. They duel “Johnny Wrestling!” “Aleister!” while the two men in question circle. Aleister rushes Gargano, Gargano rocks him with a forearm. Gargano runs in, Aleister puts him on the apron. Gargano swing-kicks Aleister back then slingshots in, but that spear goes into a knee! Cover, TWO! Aleister doesn’t slow down, he brings Gargano up. Gargano powers him to a corner then gives southpaw chops. Aleister shoves Gargano away with a boot then hops up, but has to jump over as Gargano rushes in again. Gargano runs out and jumps the leg sweep to SUPERKICK Aleister! Gargano runs, tilt-o-whirl takedown into the Garga-No Escape! Aleister scrambles around as he endures the hold, Damo returns to back senton that hold apart. Damo drags Aleister up, fireman’s carry and Wasteland slam to another back senton. Gargano breaks the cover just in time, but now Damo goes after him. Powerbomb and heavy elbow drop, Aleister breaks the cover back. Damo hoists Aleister up to the top rope, rocks him with a right then climbs up to join him. Aleister fights back, slides out, and tries for a powerbomb but Damo holds onto ropes. Gargano returns and helps Aleister to make it a DOUBLE Super Powerbomb! 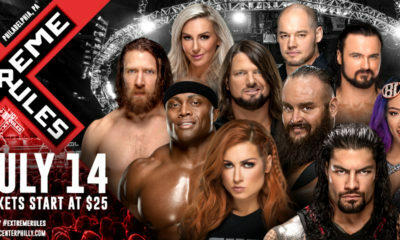 Gargano and Aleister are so tired, they can’t make the cover. Lars stirs from the wreckage of the announce desk!? And he’s making his way back to the ring! The Leviathan pushes Aleister and Gargano away and starts rallying on them both. He scoops Gargano, Aleister saves Gargano, but Lars just gets moving to run them both over with clotheslines! Lars grabs Aleister and throws him out, then picks Gargano up, spinning powerslam! Damo breaks the pin just in time. The Beast of Belfast and the Leviathan stare down. Lars hauls Gargano up to throw him out, now the monsters own the ring. They start brawling with haymakers and forearms. Lars shoves Damo, then clobbers him with a clothesline. Damo gets to a corner, Lars whips him corner to corner, Damo runs back out with a clothesline of his own! The fans applaud while both behemoths climb to their feet. They roar at each other as they collide and bounce off. Aleister returns to rally on both of them with sharp strikes. He gives Damo the strike fest, then ducks Lars’ lariat to hit the Quebrada! Roundhouse keeps Damo out, running knee strike rocks Lars. Aleister calls for the finish, takes aim, BLACK MASS! He goes for the cover but the Undisputed Era’s reDRagon appear and drag him off it! 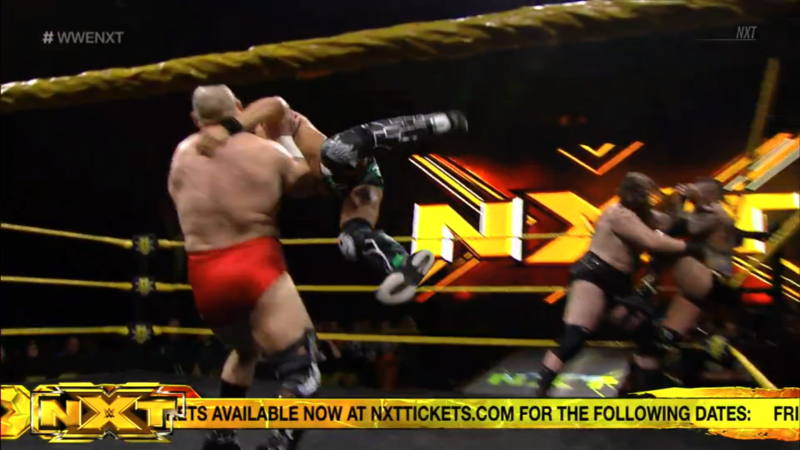 Aleister fights O’Reilly and Fish off, using a shove kick to send one into the other! He hurries back into the ring, but now Adam Cole comes out! Cole wants to personally screw over the man who eliminated him in the contender series. He dodges Aleister’s knee strike, sending that knee into the apron edge, then he gives Aleister the Last Call! While Cole stands over Aleister and admiring his work, Gargano DIVES! 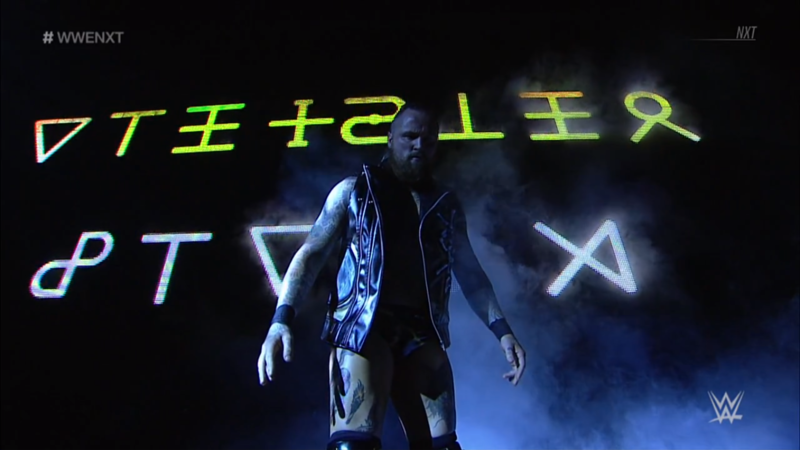 The Undisputed Era has been taken care of, Gargano brings Aleister up and into the ring. Gargano dodges Lars just in time to send him into steel steps, but Damo is upon Gargano. Damo rocks him with a forearm, lifts him for a powerbomb, but Gargano counters with a headscissors to send Damo barreling into Lars! Johnny Wrestling hurries onto the apron and aims at Aleister, slingshot DDT! Gargano wins!! 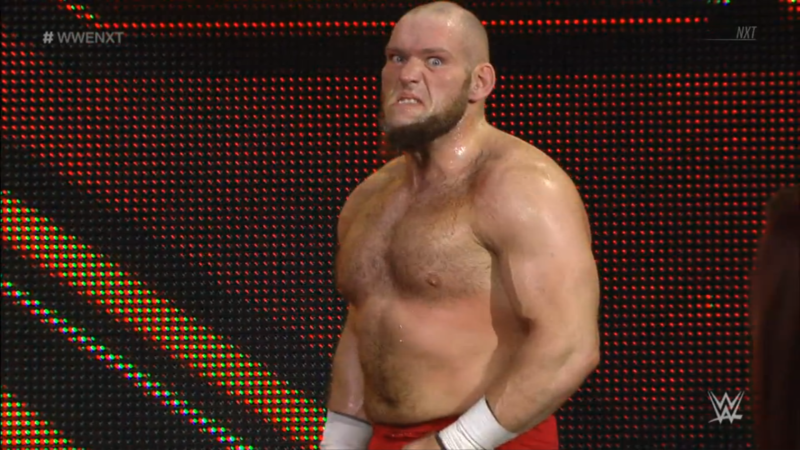 He is the new #1 Contender to the NXT Championship!! 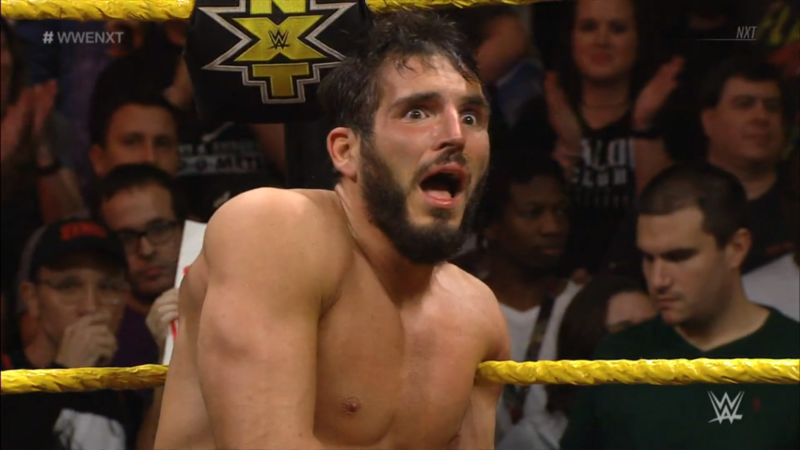 Even Gargano can’t believe it happened! The fans give him a standing ovation for this amazing rise from rock bottom. 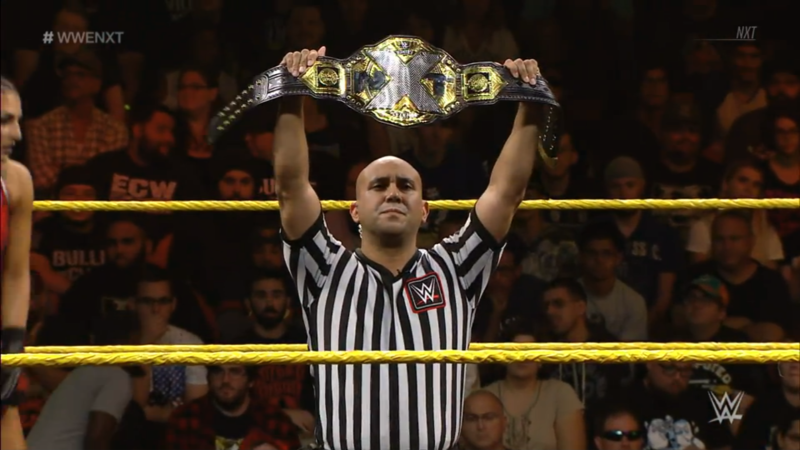 Is Johnny Wrestling just one match away from becoming THE NXT Champion? What a great night for NXT. 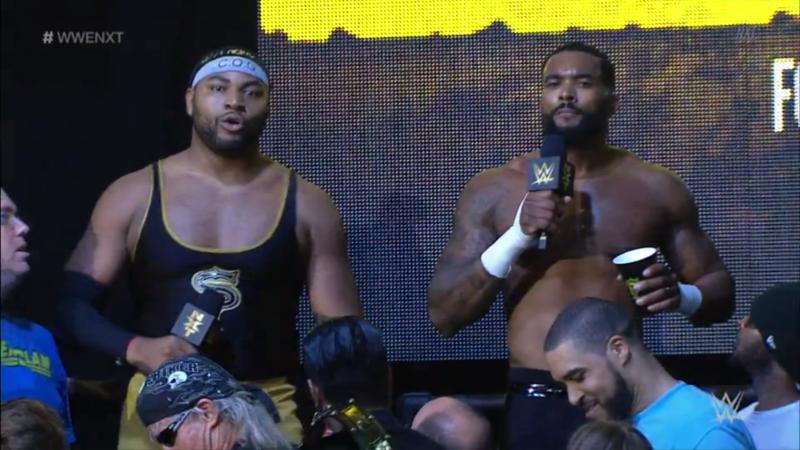 The Street Profits finally make it known that they are serious about the tag team championships. Though, given that the Authors of Pain also make it known they want back at those titles, too, the odds Dawkins & Ford become even #1 contenders drops quite a bit. Fans really love the Street Profits, though, so maybe they can surprise me with a win over Akam & Rezar by the skin of their teeth. Likewise, I knew Sonya Deville wasn’t going to become the new Women’s Champion. One, Sonya is already doing things on the main roster. Two, Ember’s reign is still too new to end on an episode of NXT TV. And three, Kairi and Shayna are both much stronger in the Women’s Division, and they’ve only really done work in the MYC. Shayna attacking Kairi was brilliant, it makes Shayna like the Samoa Joe of the Women’s Division. A rematch between her and Kairi would be amazing, but chances are it’ll be another Triple Threat or even Fatal 4 Way for the title, throwing in someone like Nikki Cross or Peyton Royce. Actually, NXT should up it to six women, as the Iconic Duo are both essentially top talent. Next week being a two hour recap show is a bit of a shame, but it must be to give time for a new taping session. It’ll be nice to look back on the great year NXT had, but I’ll be taking that Wednesday off. That aside, the main event was so incredible, it kinda makes up for nothing happening next week. Everything in that Fatal 4 was worthy of a TakeOver in itself, with high quality action and story telling. Damo and Lars strengthen their monster reputations, especially with Lars surviving that table spot a la Strowman or Lesnar. Given Almas is Heel, it wasn’t going to be Lars winning, and SAnitY VS Undisputed Era is the active story for the tag team titles so it wasn’t going to be Damo winning. Therefore, because of the brilliantly crafted story of rising back from crushing defeat and betrayal, Johnny Wrestling shocks the world by being the first person to pin Aleister Black in anything. Aleister doesn’t really lose anything losing here, his 1v1 streak is still alive, and now he has business with Undisputed Era himself. I would love to see Aleister help SAnitY against Cole & reDRagon, and Gargano to defeat the arrogant Almas to give NXT its first major change in 2018.